You don't have to be a cricket fan to know what's happening in the Caribbean at the moment. 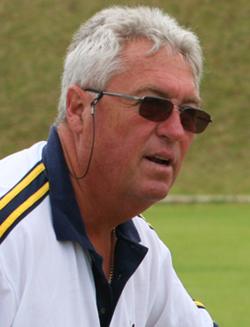 I'm not talking about the World Cup Cricket, but rather the news of the murder of Bob Woolmer - the ex-English batsman, ex-South African coach, most the recent Pakistani coach and probably one of the most passionate men in the cricket world. Investigations are still going on into who killed him and why, but there is a lot of speculation that it's related to a book Woolmer was planning on writing about the syndicated match and player fixing in the cricket world. I reckon this would have been a great book and would have been written in a very professional way. Apparently Woolmer had no intention of naming names, just letting the reader know what's happening, and allow them to make up their own mind. It seems highly unlikely a Jamaican has walked off the street, gone up to the 12th floor in a secure lift, gone along to his room, got into his room without any sign of forced entry, murdered him and then not stolen anything at all. Hmmmm. What exactly is he saying? Do Jamaican hitmen usually knick something after they've popped someone off in a posh hotel? On the radio this morning they were reporting that CCTV footage may have revealed 3 Pakistani fans may be the murders. Only time will tell who exactly killed Bob Woolmer. I'm not going to rule out any of the theories at the moment as they are all quite plausible - matching fixing syndicates don't want the publicity, and fans can get very emotional, especially when their side bombs out in the first round. I'll leave you with another great cartoon from Zapiro.